At this point in our exploration of the relationship between modern science and technology, what can we say with confidence? First, that modern science shows us that the world exists in a large matrix of possible states of affairs. The space of these possibilities is defined by the world’s initial conditions: given some physical state of affairs in the past, our world is one of its possible subsequent states. Technology can then be seen to “[reflect] a determination to act transformatively on these possibilities” (27). In other words, science tells us what’s physically possible and through technology we decide to act on them in order to change the world. In these roles, both science and technology share a problem: there is no principled way, using only their own resources, to decide what to explain or what to transform. To illustrate this, we can return to our example of winemaking. Modern science makes the process of fermentation more and more perspicuous, more clear to our understanding. With that clarity we can see which parts of winemaking are laborious, which chemicals lead to bad taste, and even how harmful byproducts might be introduced. This knowledge opens the door to a technological intervention—we might, for example, choose to use tools which speed up the fermentation process or which reduce harmful byproducts. But where should we draw the line in modifying the traditional process? At what point does technologically optimized wine stop becoming wine? Science was in historical fact a liberating event (from superstition to true understanding, etc…), therefore it has delivered a new and concrete way of engaging with the world. Scientists are held to unparalleled standards of correctness and achievement, therefore what is active is a new worldview. The chaos in our world comes from a failure to follow scientific ideals through completely, therefore science must embody a distinct worldview. Of the three arguments, he only considers the first (which he considers to be the strongest) in detail. It is true that as scientific theories advance, real and well-documented clashes occur. When these clashes are against the powers of the day, the clash is seen as a revolution and science is typically on the side of liberation. But, as Borgmann points out, science in this role is always a liberation from, not a liberation for. What he means is that by casting sufficient doubt on established ideas, science can provide incentive to revolt, but it can never produce a substantive framework of its own, out of its own resources. Here Borgmann draws upon the idea of deictic resources (world-articulation, rather than world-explanation): “Withdrawal of scientific endorsement forces a worldview back to its deictic resources” (29). If that worldview has no deictic resources, it may very well perish (as we have seen with alchemy). But strongly deictic disciplines such as poetry and art do not, predictably, disappear with the advance of science, since they are not in the business of world-explanation. For this reason Borgmann declares the scuffle between science and theology to be pointless—science is not satisfyingly deictic enough to warrant the discarding of theology, which can provide concrete orientation for our lives. The main point is that science as a sociological phenomenon cannot guide us from within its own center (i.e., its laws and theories), but must lean upon external resources for leadership. That doesn’t mean, however, that science cannot rise in power without those guiding resources. And this approach, like a car with the driver asleep at the wheel, can have disastrous consequences. We might engage technology as the inevitable outgrowth of a science that sees reality as an infinite manifold of pure, moldable substance, begging us to transform it. Borgmann is not quite so pessimistic, however, and reminds us that it is possible to distinguish the scientific method (i.e., the heart of science’s laws and theories) from the worldview just expressed. This enables us to separate science from technology and find a place for science without viewing technology as necessarily having the same privileged status (a status which flows from true explanation). Science is a necessary precursor to a technological age, but it is not a sufficient condition for it. How then can we explicate technology if not as a necessary consequence of science? Borgmann believes we need to begin by looking at the fundamental pattern of technology. We will do that when we transition to Part 2, which begins with the next chapter, “The Promise of Technology”. Nice to be wrapping up this first part of the book 🙂 There are starting to be hints to how technology plays a crucial role but the discussion is still about establishing Borgmann’s view. I do like a number things in this chapter. First, technology cannot provide full guidance to all problems — that is, it is not simply a problem-solving endeavor. Second, our understanding of things is alway precarious. We can do the best that we can through the science-technology relationship but have to know that the understanding may be fleeting. Finally, as mentioned in your post, science often opposes world views. Eager to move on to Part 2. 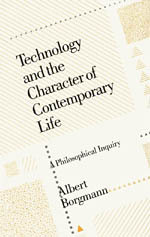 Yes, as you’ve been pointing out, most of these early chapters are set-up, doing some philosophy of science in order to clear the ground and stave off initial objections to Borgmann’s ultimate aim: to give a “paradigmatic” explanation of technology, which will be more explanatory than a “scientific” explanation of technology.